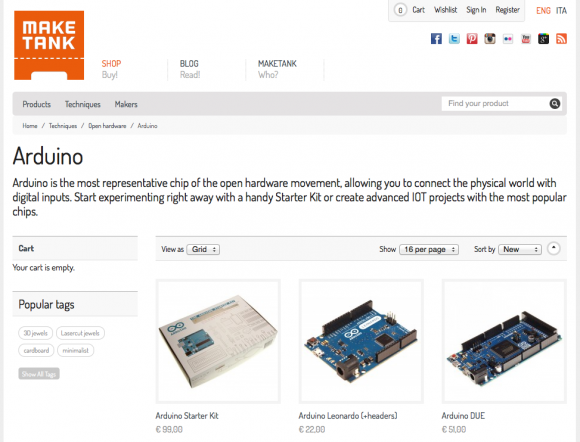 0 Arduino is on MakeTank! We are very pleased to announce that Arduino is now available on MakeTank, coinciding with the launch of our DesignWinMake contest on the theme of Open Hardware. We've put the most famous Arduino chips in our store, as well as the super handy Starter Kit which will immerse you immediately into the world of Open Hardware, with a booklet of simple projects to get started. With documentation online and off, as well as courses available in every city and FabLab (like the Arduino Cafe by FablabFirenze that we attended), you'll be hacking in no time. Getting started with Arduino isn't about showing off your (possibly non existent) programming skills, but rather makes you part of an every larger community of people who are passionate about sharing, who believe that this can make a positive impact on our society and radically modify the business models upon which our currently failing economy depend. All of this sounds like a visionary pipe dream, a story imagined around a chip and some wire, but if you've ever heard Massimo Banzi speak about Arduino, you'd change your mind. We put one video below (in Italian with English subtitles) that explains the basics of the product, but a little time navigating online will find his keynotes (check out his TED talk, for example). Don't miss out - buy an Arduino Leonardo, UNO or DUE today! If you would like to acquire Arduino products not listed on our store, or for volume purchases, please contact us.